A number of Paris institutions are commemorating the centenary of the First World War with exhibitions such as ‘Summer 14’ at the Bibliothèque Nationale, ‘Jaurès’ at the Archives Nationales, and ‘Vu du Front, représenter la Grande Guerre’ at the Musée de l’Armée. Eschewing this current solemnity, however, is the Petit Palais, which takes us back to its glitzy roots in fin-de-siècle Paris. The Petit Palais opened for the Exposition Universelle in spring 1900 (as did the Grand Palais and the Pont Alexandre III), making it the perfect location for this sumptuous aesthetic exploration of the Belle Époque. The exhibition opens with early film footage, taken by the Lumière brothers, of visitors ascending the steps to the Petit Palais in 1900, all cinched waists, hats and parasols. Film footage punctuates the exhibition throughout, often displayed in mirrored passages which capture something of the whirling excitement of the time. In one film, visitors even hop on and off a moving walkway between exhibition sites (any modern-day visitor to Paris who has the misfortune to pass through blighted Châtelet or Montparnasse will say moving walkways in Paris 2014 have lost some of their je ne sais quoi). The first room ‘Paris, showcase of the world’ gives us an insight into the far-reaching impact of the Exposition of 1900, from architecture and urban infrastructure (including Hector Guimard’s Art Nouveau metro entrance) to its populist appeal (displayed in films and sketches of carnivals and parades) and delightful ephemera such as ladies’ fans that double up as maps of the Exposition, commemorative handkerchiefs, and decorated plates. The spectacle weaves its way from this first section through Art Nouveau, furniture, objets, painting, sculpture, fashion, photographs and posters. The room dedicated to fine arts is a refreshing insight into the homogeneous art scene c. 1900. 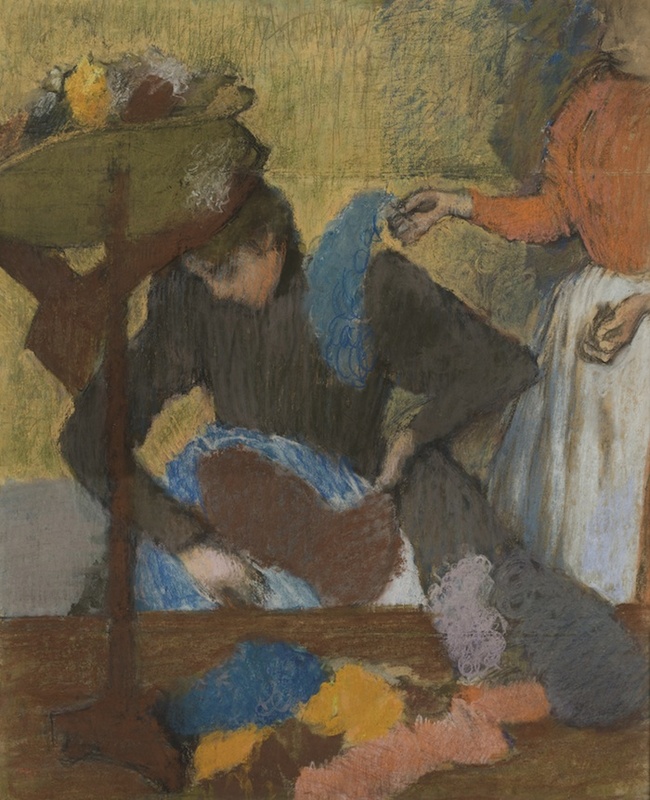 Monet, Renoir and Cézanne vie with the younger Nabis, Aristide Maillol, Maurice Denis and the continuing academic presence of Jean-Léon Gérôme and William-Adolphe Bouguereau. One of the most striking paintings is by Edgard Maxence, Les Fleurs du Lac – a haunting mix of Pre-Raphaelite-esque medieval inspiration, modern angular faces and stylised landscape. 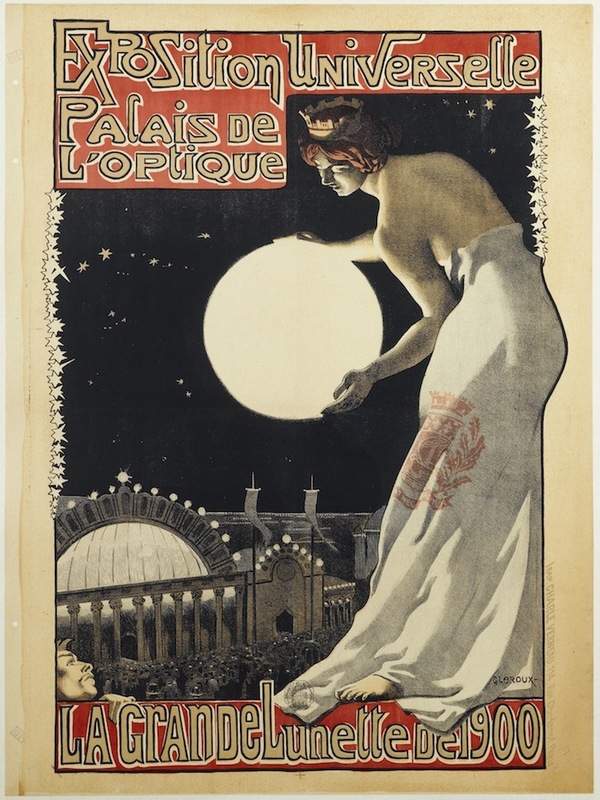 The spectacle of the Belle Époque would, of course, not be complete without the nightlife and Parisiennes, both of which have sections dedicated to them, and which include dresses (from the collections of the Palais Galliera) and the infamous posters that immortalised the cabarets. A more enclosed space displays black and white photographs of naked pin-ups and more matronly looking (dressed) ladies of the night wishing to advertise themselves in luxury brothels, such as the well-frequented Le Chabanais. Amongst the high-class clientele of Le Chabanais, was Edward, Prince of Wales (future King Edward VII of England) whose personally-designed ‘love seat’ is also on display. One’s mind boggles. 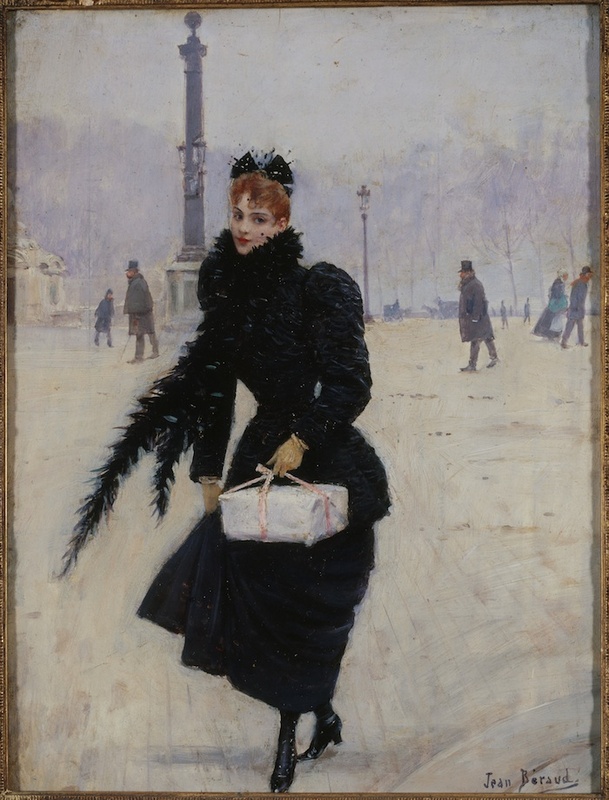 ‘Paris 1900’ is at the Petit Palais, Paris, until 17 August 2014. 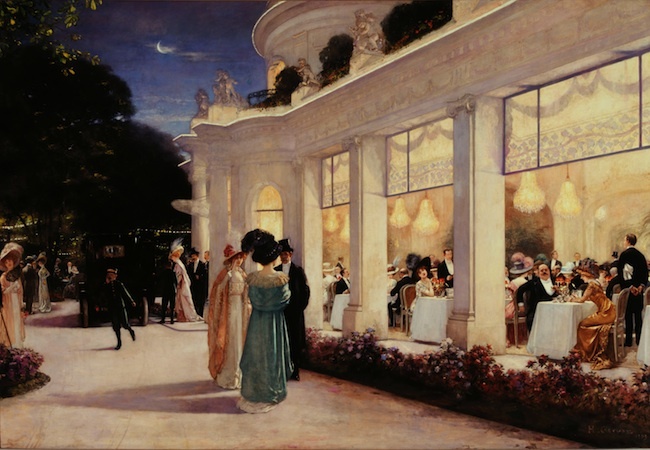 Click here for an interview about ‘Paris 1900’ with Christophe Leribault, the director of the Petit Palais and here for a gallery of highlights.